Pedestrians and cyclists rightly consider fear big, multi-lane streets — but a new report points out that small, single lane streets can be perilous as well. The report by Localize.city, a data-driven website, crunched NYPD collision data to find that many dangerous small streets are clustered together. The neighborhoods with the most crashes on small streets between 2013 and 2018 were Williamsburg, the Lower East Side, North Corona and Ditmas Park. There are 25,350 intersections of one-lane roadways in the city. They comprise roughly 40 percent of all intersections, but are the location of only eight percent of all injury-causing crashes — with an average of just .2 crashes between 2013 and 2018, according to data compiled by Localize.city analyst Israel Schwartz. But many neighborhoods have extremely dangerous one-lane crossings — with the most dangerous averaging close to seven crashes over the same five-year period. It’s a finding that will surprise many people, who might be inclined to think that one-lane roadways are safer. It’s not the first time Queens has been cited for danger. 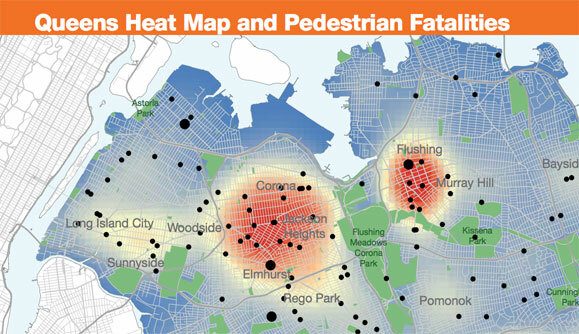 This map is from 2015, when local politicians called for more safety improvements. Many dangerous one-way crossings are clustered in Corona, Schwartz said. For example, six pedestrians and one cyclist were injured at the intersection of 37th Avenue and 101st Street, while five pedestrians and one cyclist were injured two blocks away at 37th Avenue and 99th Street. The Avenue is a commercial strip with parking on both sides and no bike lanes. The Lower East Side also has a cluster of dangerous one-way crossings. Eighteen pedestrians were injured on Rivington Street between 2013 and 2018, Localize found. Seven pedestrians and four cyclists were injured at or near where Rivington intersects with Ludlow Street. Five pedestrians and two cyclists were injured near the intersection of Rivington and Clinton streets. Williamsburg, eight pedestrians and 11 cyclists were injured in a 10-block radius. Five cyclists and two pedestrians were hurt at the intersection of South Third and Keap Streets. Seven cyclists and four pedestrians were injured four blocks away at the corner of South Third and Havemeyer streets. At Hooper and South Fifth streets, two pedestrians and four cyclists were injured between 2013 and 2018. In Ditmas Park, 13 pedestrians and cyclists were injured along Newkirk Avenue over the five-year period. At Newkirk and Argyle Road, four pedestrians and three cyclists were injured. At Newkirk and Rugby Road, four pedestrians and two cyclists were injured. Street safety advocates say the city needs to improve protections for pedestrians in one lane streets by updating them to give pedestrians more space. The soon-to-be-updated action plans are archived here. Localize’s website is at www.localize.city. Once congestion pricing is enacted the Lower East Side should receive a reconfiguration where most streets are pedestrianized. I think a great pilot would be between Delancey and E Houston St, from Allen to Essex St. All north/south streets between should be pedestrian only and allow for deliveries along Rivington and Stanton St, 5 MPH speed limit (no for-hire or private autos). Very heavy pedestrian activity, including late night. They should but they’d never pedestrianize an exit off of the Williamsburg Bridge. I ride the rivington st lane often. It’s cars and trucks jockeying to get to the bridge. Prob could use a light. Well Orchard St is already pedestrianized on Sundays. Maybe after CP we will have more options. Definitely a problem area. However, I have also seen people walk right in front of cars not paying any attention what so ever. I think a light would help as well. Action Plan Ups NYC’s Commitment to Ped Safety, But Is NYPD on Board?